KTM, the European Racing Legend, conducted the first ever “Orange day” for customers Delhi. The “Orange day” is conceptualized to make the customer experience the racing genes of the KTM 200 Duke. It gives the KTM owner an experience of performance of 200 Duke and also an opportunity to interact with the fellow KTM 200 Duke owners on a race track. The “Orange Day” was organized at Indira Gandhi International Airport, Terminal 2 Road, New Delhi. The Orange Day started at 9:00 AM with the riders registering themselves for the racing. A classroom session was organized by a racing expert on the basics of racing and how to extract the most out of the KTM 200 Duke. This was followed up by a demonstration on the track and then the final race. Podium finishers were awarded and the event ended with a breath taking “stunt show” on KTM 200 Duke. 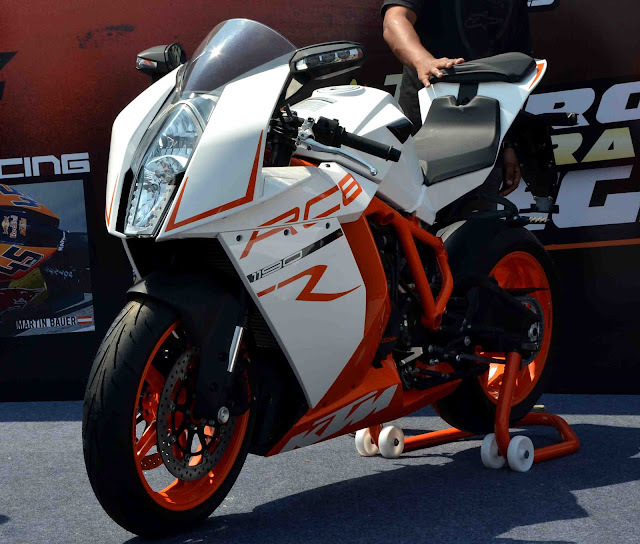 Another highlight of the show was the unveiling of KTM’s 1190 cc Superbike the RC8 R. All the KTM owners in the city were invited to participate in the Orange Day. Besides all the action on the track there was service-camps, stalls for KTM Power wear and Power parts, refreshments, music and a general ambience of fun and camaraderie. Till now KTM has organized “Orange Day” at Pune, Mumbai, Bangalore, Hyderabad, Ahmedabad, Noida, Chennai, Vadodara, Jaipur, Kochi and now in Delhi . More KTM “Orange Days” would be organized in other Metro towns of India. At the end of the event KTM also unveiled its 1190 RC8 sports bike which will be only on display at KTM Showrooms across India.